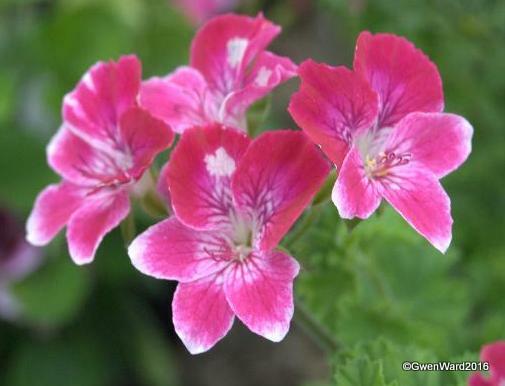 .I had no information about this pelargonium - except it was first listed in the UK in Sulman's Catalogue in 2002. But Maria in California reminded me it was raised by Jay Kapac in the USA and is one of the archangel series of Angel Pelargoniums. The others are Michael and Raphael. Raphael is no longer available in the USA. It might be still available here in the UK . Many thanks Maria for this information. "Gabriel" is a very pretty Angel Pelargonium which I have grown in the past. 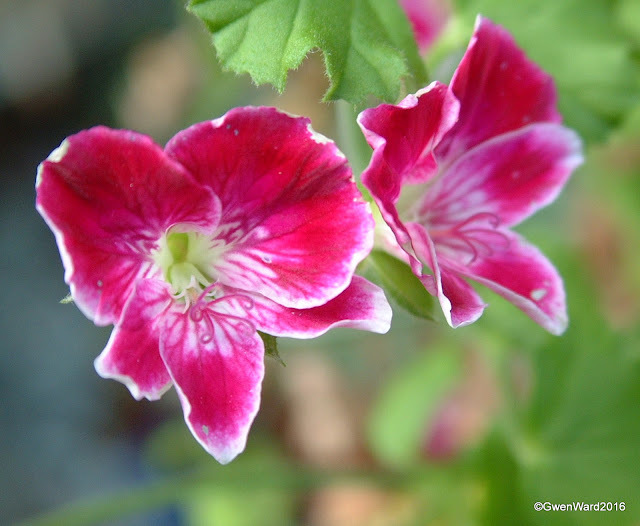 It has small bright cerise flowers with a paler centre. It tends to be rather sprawly so looks good in a hanging pot with lots of pinching out. 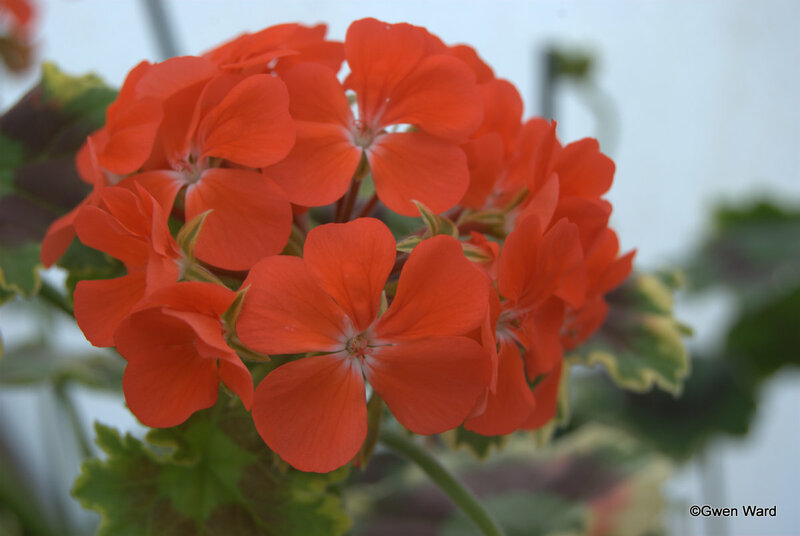 It's a quiet time of year in the greenhouses, apart from removing yellowing leaves and any flowers that appear. I have also been checking over the cuttings I potted up a couple of months ago. Watering is kept to the very minimum. The angels I find do need more watering than the zonals, species and scenteds. When I find I do need to water then I water into the pot rather than the top of the pot and try to avoid splashing water on any leaves. It can be a slow job. Happy Christmas to all my followers. Syn. Golden Brilliantissimum. Golden tricolour. Similar to Contrast, but base colour more yellow. Small scarlet flowers. Introduced in 1873 by Gibson and Park simultaneously. I was given this plant a couple of years ago and I can never tire of it. The leaves are so bright. 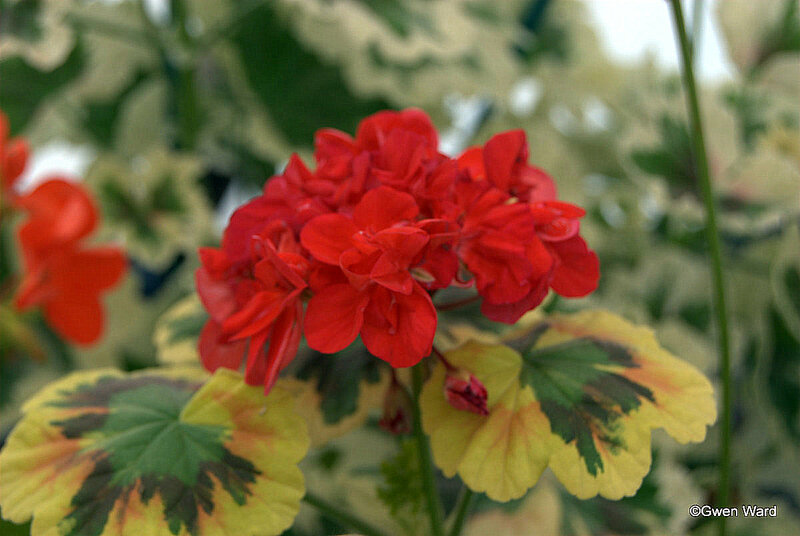 Like all the tri-coloured leaf pelargoniums, It is a slow grower, but worth growing. I have been taking advantage of the mild weather to take more cuttings, which seem to be rooting fairly quickly. I do have them in the heated propagator in the conservatory. Those that have rooted are now potted up. I will leave them in their 7cm square pots until spring when they will go into appropriate size pots. 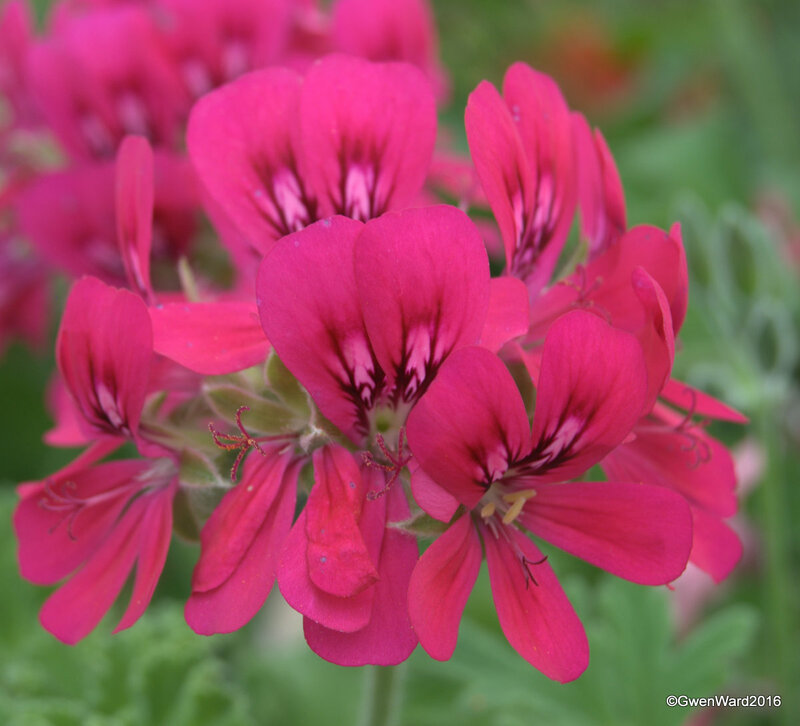 Zonal Pelargonium "Skies of Italy"
Raised by Derek Clifford and introduced in the UK in1970. "Skies of Italy" has small single scarlet red flowers. The leaves have a yellow edge, which is finely notched and have a chocolate brown zone. Not often seen these days. Now that autumn has arrived here in the UK I have been busy getting the greenhouses ready for winter. All of the outside pelargoniums are now cut back, checked over for slugs and other nasties, and moved under the benches. The bubble wrap is up, apart from the fronts which I leave until we get notice of a severe cold spell. The fronts of each greenhouse faces south west and does not get the cold northerly winds. I prefer to leave them un-bubblewrapped to let in as much light as I can. So far, although we have had some cold northerly winds, it has been mild, so I have not needed to have heaters on. This old variety of basic zonal was raised in Australia by Bode and released in 1958. 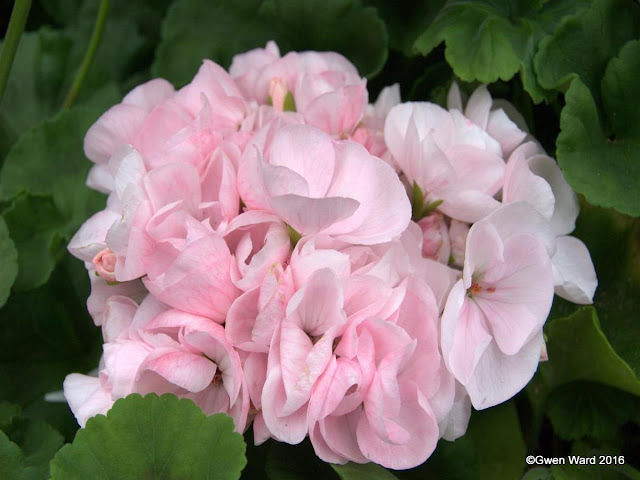 It has single flowers of dark pink and the leaves are bright green with a wide chocolate brown zone. This year I have started to gather a small collection of Unique Pelargoniums. 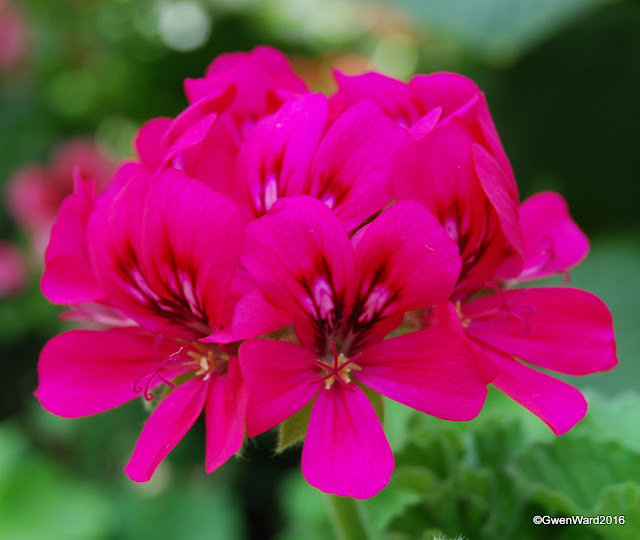 These are an old type of pelargonium, which differ from the more popular types. They have a different growth habit, as well as flowers and leaves. Over one hundred years ago the Unique types were very popular, but are not often seen or grown today. In her book, Geraniums, "The Complete Encyclopaedia", Faye Brawner says that P. fulgidum is reputed to be a common ancestor of the Uniques, and it's influence can be seen in some, but not all of the types. No records have ever been kept of which plants were used in their ancestry. In the 1960's, the American hybridiser, Frances Hartsook bred a number of Uniques that would be able to cope with the heat of a desert area of Mexico, where she was living at the time. She used various regals and Old Scarlet Unique in her crosses. Sadly Miss Hartsook seems to have lost her original records with the parentage of her Uniques. Last weekend, on the way home from a short stay in Lincoln, I visited The Herb Nursery, a small nursery in Rutland. 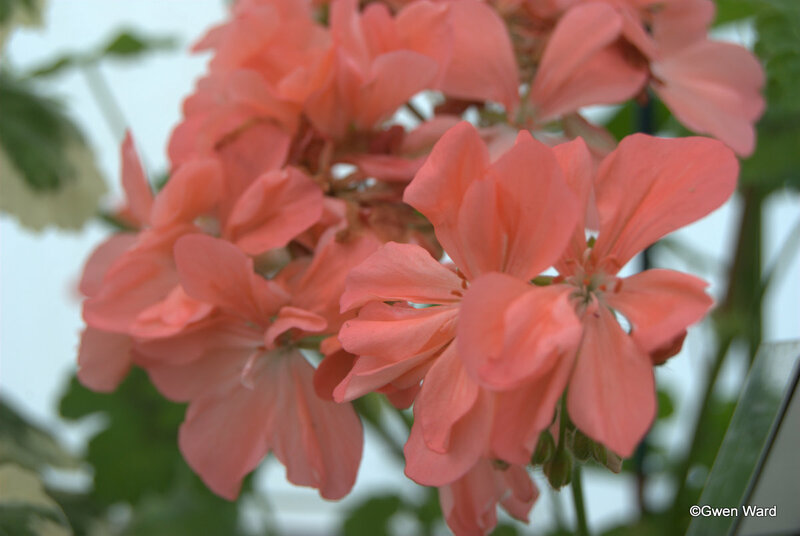 They have a collection of pelargoniums, as well as herbs and many other garden shrubs and perennials. Naturally, the pelargoniums where what I went to see. I was not disappointed and I can highly recommend this small neat and charming nursery. All the plants were well grown and all looked very healthy. Rollison's Unique was one of the plants I came home with, as well as three others. Originally introduced in the UK c.1880 and supposedly registered in 1835. 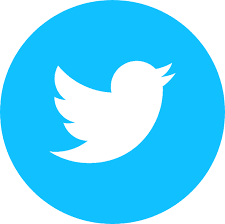 Raised by Keith Kitson and introduced in the UK in 1975. Dark green leaf, lightly zoned. Compact and dense growth, short jointed. Earlier this month I went to Sweden to stay with Anne Hammarqvist and to visit her local Society's Annual Flower show and sale. It was a wonderful experience and Anne and all the members of Malardalens Pelargon Vanner made me so very welcome - I felt as if I had known them always. 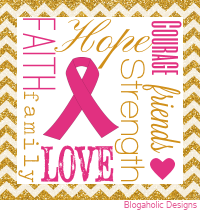 Thank you all for your friendship and generosity. Here a some photos I took of the show. 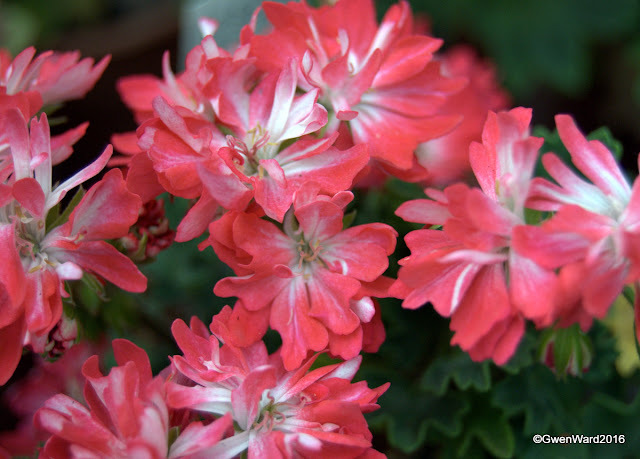 Ken Dymond, who sadly passed away last week, raised many pelargoniums. He was a very experienced hybridiser and was well known for the Quantock series of Angels which he named mainly after family members. He also introduced the Mendip range of Regals and a few zonals with the prefix Blackdown. Ken was also an experienced Pelargonium Judge. He will be sadly missed by many. The Pelargonium & Geranium Society held their Eights National Open Show last month at Capel Manor. All the exhibits were of a very high standard. The following are just a few of the photographs I took.